Start the celebration on an adorable note! 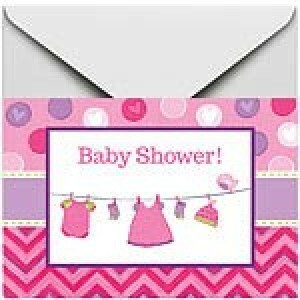 'Baby Girl Clothes Lines' postcard-style baby shower invitations feature baby clothes with chevron print and polka dots, and have lines on the back for your guests' name, the date, time, and place of the party, as well as RSVP info. They even come with save the date stickers for your guests' calendars! Start the celebration on an adorable note! 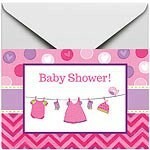 'Baby Girl Clothes Lines' postcard-style baby shower invitations feature baby clothes with chevron print and polka dots, and have lines on the back for your guests' name, the date, time, and place of the party, as well as RSVP info. They even come with save the date stickers for your guests' calendars! Invitation pack includes: 8 Postcard invitations, 15.8cm x 10.8cm (6.25'' x 4.25'') each 8 Pink envelopes 8 Sticker seals, 3cm (1.25'') each 8 Save the date stickers, 3cm (1.25'') each.